3. or, worse yet, has purchased rare coins only to find out they were worth a fraction of what they thought they were worth. Ever since ASI offered its unique Rare Coin Program (RCP) as part of the Rare Tangible Assets (RTA) strategy, I've heard from people who bought coins from other sources and were disappointed in the results. What they thought were true rarities, were not. I was disturbed and concerned that because of their earlier bad experiences they would pass up the great opportunities that true rarities do offer. Our clients, readers and friends need to know the difference between truly rare coins and heavily marketed or limited edition collector coins. We do not want you to languish in any earlier missteps. ASI now offers a service to help you evaluate and sell your current coin holdings and convert those proceeds into the RIGHT coins through RCP. Real Authenticated Rare Coins. Before I explain the ins and outs of true rarity, let's explore why so many investors, dealers and mints want to jump on the rare coin bandwagon. 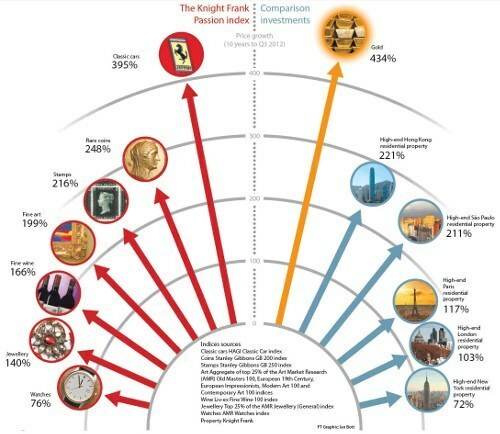 The Knight Frank Rare Coin Index has seen an average gain of 11% annually over the past 40 years. 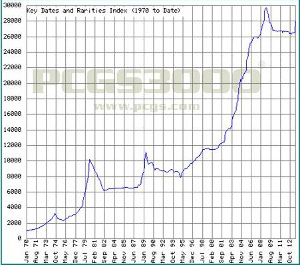 Rare coins have outperformed the stock market over that time. In the last 10 years, it is the top earning collectible asset class behind only classic cars, you don't have to build a new garage to store them, and they are much more affordable to new investors. Like fine art, recognizing a truly rare coin is a lifetime pursuit only successfully done by dedicated, expert dealers or devoted, passionate collectors. Those who want to jump on the rare coin bandwagon take shortcuts to buy and sell coins inferred to be rare when they are not. Whether intentionally misleading or unintentional, myths of rarity are perpetuated when you confuse rarity with limited quantity or limited edition. There are three major myths surrounding the non-rare coins masquerading as rare coins. Only when you understand true rarity will you become suspicious that your coin performance might in fact, not live up to the expectations demonstrated in the famous Knight Frank Luxury Index. We have all seen, and many of us have purchased, beautiful new coins from private mints, or limited edition U.S. government minted coins, in elegant velvet display boxes. They are sold as perfect condition, early releases or first strikes. They seem valuable because they are pristine with regard to color, and beautiful, are struck in genuine gold or silver, and have a story to tell. Some might be historical, others show a nature scene, and still others depict an important event. These heavily marketed coins have a great deal of eye appeal. They carry high grades from reliable sources because they are new and unused - much like a flawless diamond of unique color, cut and clarity. Unfortunately, they are not truly rare, and you won't realize this until you get an evaluation. By then, it might be too late for your portfolio to recover. These coins are limited; and the mints break the mold after producing a limited number. So, why aren't they rare? Think of it logically. Old coins minted as currency and used in trade, are not often found in perfect or in mint condition. They were not designed to appeal to a commercial market and may not be beautiful (although many are). More importantly, they were not saved, except by collectors or by accident. These old coins are not limited by design, but by loss, toss, natural use, or deterioration. If they are in great condition, it is by happenstance. Those that do survive in mint or even good condition are truly rare. By contrast, limited editions are minted specifically as a would-be investment. They are deliberately limited to a relatively small number. It is unlikely many will be lost, spent, or disposed of in any way. Keep in mind; the majority of these coins are preserved in MS-70 (perfect) condition from the very beginning. There is little to no risk a collector will be unable to find one of these coins in perfect condition or that passionate collectors will pay the price to own one. The rare coin market is a luxury market driven by the desire of collectors to own what is hard to own. Nothing is easier to own than these highly marketed limited editions. One hundred years from now, it's unlikely these coins will have appreciated the way you want, or thought they would. Also, who is to say that one particular set will be popular in a hundred years? Who will want your set then? Who would be willing to pay a high premium? You might be thinking all pre-1933 gold coins are the same. Nothing could be further from the truth. 1. History has shown us there is a huge world-wide collector market for these coins. 2. These coins have been proven as truly rare coins. Remember, truly rare coins are extremely valuable, in part, because they are hard to find in near perfect condition. If your special limited edition set is certified in MS-70 perfect condition right from the start (along with hundreds or thousands of others), odds are it won't be hard to find perfect examples of them even a hundred years from now. This severely limits your upside in this type of investment. If they do increase, it will not be comparable to that of a truly rare coin. There are many resources, and even coin dealers, who state that semi-numismatics are just like rare coins, only cheaper to buy. Not so. Semi-numismatic coins are often good additions to your precious metals portfolio. In fact, ASI sells semi-numismatics and will often add them as a bonus coin when we do special promotions. The $20 gold Saint Gaudens, along with Morgan and Peace silver dollars, are good examples of popular semi-numismatic coins. We like them. They add value above spot price and act almost as a dual investment; part in collector value and part in precious metal value. But they are not rare. Their value is still partly connected to bullion prices and will rise and fall along with the rest of your precious metals portfolio; not with the uncorrelated tastes of collectors. Semi-numismatics have their place, but to achieve the true non-correlation you are looking for, you have to go with rare coins. Semi-numismatics cannot protect your portfolio, decrease volatility, or have the same potential profit level as the Uncorrelated assets in the Rare Tangible Assets strategy do. Such profits are generated by the interest of collectors. Collectors want unique, special, individual coins and will pay the price asked to acquire them regardless of other market pressures. That is why rare coins are uncorrelated, not only to the securities markets but to precious metals, as well. RTAs dance to a different drummer than any other asset class, making them a foil in times of volatility or currency devaluation, while other asset classes act in lockstep with each other. While semi-numismatics can be a nice alternative to an ounce of gold or silver, they should be counted as part of your precious metals portfolio, not as a Rare Tangible Asset. "If you can add it to your shopping cart online, it's not rare enough." "Sure, how many would you like?" ... you aren't getting as rare as you want. While this may be overstating the case, you get the gist. If it's easy to fill orders demanding the same coin, it's most likely not of a level of rarity at which a serious collector would have an interest. I've also seen clients spend a large amount of their retirement savings on catalog coins with "beautiful packaging". PLEASE DON'T DO THIS! You would be surprised how much a glossy catalog page with a nice gift set box can get you into trouble. A client called me last week with a list of coins looking for a current valuation for his year end taxes. I told him it was currently valued at approximately $11,000. I was shocked and saddened to learn he had spent over $30,000 of his retirement funds on these coins less than two years ago. This is not a case of the market went down; this is another example of making sure you trust the experts when making decisions about your rare coin investments. You would do the same with any other investment strategy, wouldn't you? Your rare coin portfolio is hand-picked by Doug Winter, the world's leading expert on pre-1933 U.S. rare gold coins. Doug and ASI will search for rare coins that fulfill your purpose, goals, budget, and timeline. Doug and ASI will work closely with you to acquire the right rare coin combination that makes sense for your net worth, protection and growth. We are also here when you sell - not just when you buy. Here again, Doug, with his vast international network of collectors and buyers, is by your side. Should you plan to create a legacy, as many of us at ASI are doing for our own children and grandchildren, we encourage you and your family members to speak with us. We want to help you instill in them an appreciation of what rarity means. Perhaps some will be moved to become collectors, but that is not our purpose. We simply want them to be savvy owners of these uncorrelated assets. Regardless of the size of your holdings, please call us at 877-340-0790 and allow us to evaluate your coins. Whether they have been occupying your jewelry drawer, bank vault or just arrived in the mail, we welcome the opportunity to see if we can upgrade what you have to fulfill your original goal of owning truly rare coins. This is a good time to buy - and a great time to exchange lagging assets for those with great potential. It's easy to get excited over the performance of rare coins because they are the best performing luxury asset in the world that doesn't need a new garage to hold them! Get results with coins - but only with true rare coins hand-picked by Doug Winters. Let the expert guide you. Call us at 887-340-0790 or send me an email for more information.